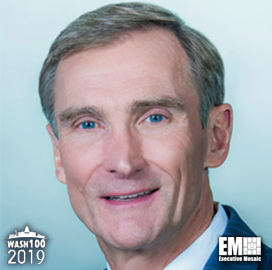 Executive Mosaic is honored to introduce Roger Krone, chairman and CEO of Leidos, as an inductee into the 2019 Wash100 — Executive Mosaic’s annual selection of the most influential voices in the government contracting arena — for his leadership and efforts to create innovative technology solutions in defense, intelligence, health and other federal markets. This marks his sixth consecutive Wash100 win. Krone has been advocating for the increased coordination of private aerospace companies and the federal government to promote innovation. In an interview with Aerospace Industries Association in March 2018, Krone said the U.S. is facing challenges modernizing and maintaining its military technology base and is struggling to upgrade critical infrastructures. However, he also noted the industry has received less funding or support to address national issues despite the high global threats to U.S. interests. “IT growth and progress are unattainable unless the industry as a whole is committed to working together to address the drivers, trends, pitfalls and opportunities around us,” the Leidos CEO said. Krone led Leidos’ acquisition of Lockheed Martin’s information systems and global solutions business in 2016 to expand the firm’s presence in the federal IT market. The official said Leidos is focused on the defense, intelligence, homeland security, civil and health markets. The company intends to provide its customers new, modernized IT platforms and technologies to increase efficiency. Krone joined Leidos in 2014 following 22 years serving Boeing in leadership roles.He joined Boeing in 1992 as the vice president and treasurer. He held that position for five years before serving as the president of Network and Space Systems for 17 years, providing calculated direction for almost 15,000 employees across 35 states and 12 countries. He also worked for General Dynamics for 14 years in a wide range of positions in engineering, finance and program management. With Leidos, Krone’s strategic vision remains focused on its customers, shareholders and employees. He is the driving force behind the company’s culture to create innovative technology solutions responding to customers’ challenges today and tomorrow. Executive Mosaic congratulates Roger Krone and the Leidos team for their selection to receive this award. This year represents our sixth annual Wash100 award selection. The Wash100 is the premier group of private and public sector leaders selected by Executive Mosaic's organizational and editorial leadership as the most influential leaders in the GovCon sector. These leaders demonstrate skills in leadership, innovation, achievement, and vision.